Ever since I did our dining room makeover at the end of last year (was that really a year ago!) I’ve been on the hunt for some new placemats. So when I was asked to review a product from the lovely Scarlett Willow website, it was the perfect opportunity to try some. Scarlett Willow, a fantastic name I know, creates and sells on trend, modern tableware. It’s good quality, beautifully made, functional and practical. 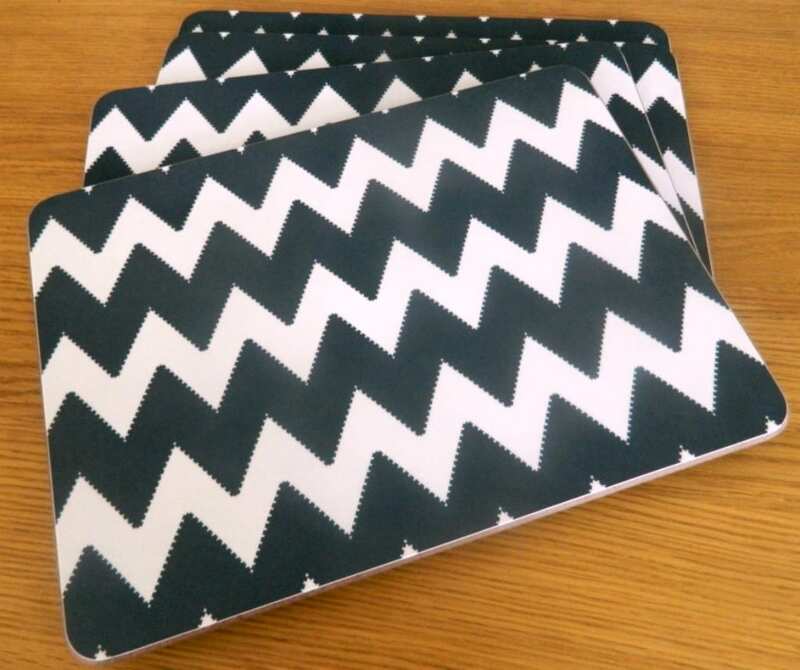 After leafing through their site I chose these lovely Chevron placemats from Scarlett Willow which are ideal for me. Firstly I love anything bold with a graphic print so I knew they were my thing. What I did struggle with is which colour to choose. Available in four distinct colours, Coral, Dark Green, Grey and Bright Pink, any would have been perfect to be honest. In the end I plumped for the Dark Green and waited patiently. Scarlett Willow’s products appear to be of high quality and the set of 4 placemats retails at £45.80. But as you can see from the shot above they arrive in a beautiful box and were beautifully packaged too. The mats themselves are thick and sturdy, much better than other’s we’ve had in the past and I can see the quality in them. The colouring is lovely and just what I was after to co-ordinate with the rest of the room. I really loved the idea of being able to order a set of mats in all four colours in the one box – a mixed set and almost did this as I couldn’t decide. But in the end I’m really glad I went with the green. As a family we try and sit at the table together for mealtimes whenever we can, and failing all others we usually manage it for Sunday lunch each week. The girls have the job of laying the table and were thrilled to have some new placemats to deal with. And in a box! There was much discussion over who was getting them out and who was putting them away. If you’re a parent you’ll be familiar with this kind of negotiation. Would we recommend Scarlett Willow placemats? Do you know I think we would! They’re a beautiful gift for a wedding day, or anniversary and ideal if the recipient is a lover of modern and contemporary designs. 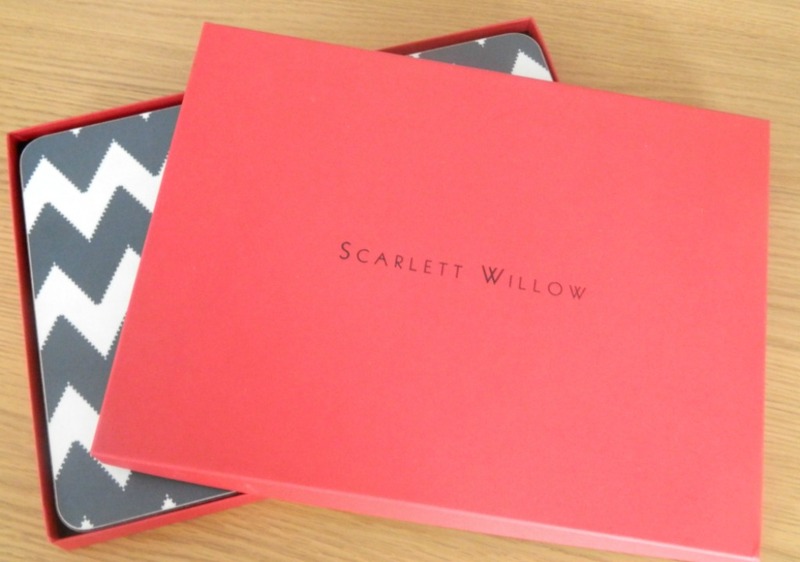 You can check out more of the range from the Scarlett Willow website here. I’m particularly fond of their glass platters too. 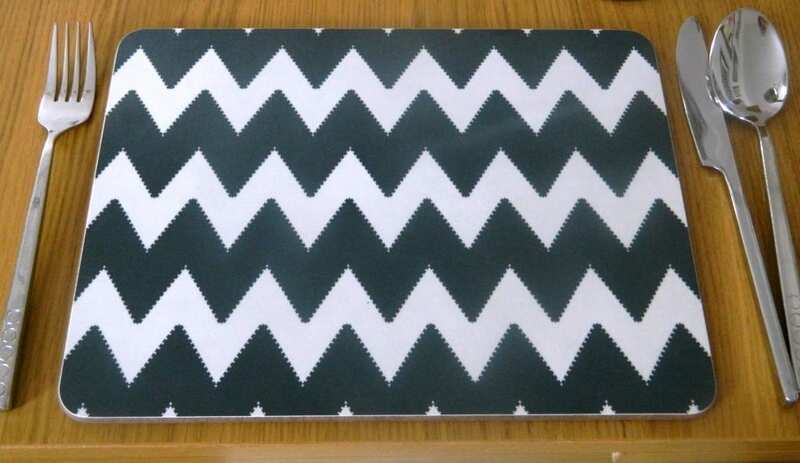 Disclosure: I was sent a set of 4 Chevron placemats to review for this post free of charge. The comments and opinions are genuine and my own. Fab print. I adore black and white and these are so chic. I love these! I’m a bit obsessed with all things chevron at the moment. We only did our dining room up a couple of years ago, but my husband wants to redo it again. These would go really nicely with what he wants (that’s if he ever gets round to doing it!! ).